So a little bit about our kids’ school history. When Fighter turned one, Julia Gabriel Center approached me to try out their baby class, called Play Nest, for babies aged six to eighteen months. Fighter went through Play Nest, then Play Club (18 months to three years) then he progressed to preschool at Chiltern House, which is a sister company to JGC. Disclaimer: I was partially sponsored for Play Nest and Play Club, but I decided to then continue with the school on my own without sponsorship cos I really liked it! Penny was enrolled in Play Club for a while too and recently I switched her to a new program called Independent Play Club. Now I have considered other schools for the kids as well but always decided to stick with Julia Gabriel and Chiltern House. Of course I don’t know how other schools are run but I thought this blog post could be about the different programs offered by JGC/CH and what I like about them! Play Nest is an adult accompanied program for babies in this age group. It’s twice a week, for 1.5 hours each. Every baby has to come with an adult – mom, dad, grandparent or nanny – and the classroom is laid down with soft mats. Cos some babies cannot walk yet hahaha. This class will make your ovaries sing lolol. It’s actually super adorable with the soft chubby babies rolling or crawling around the mats hahaha. I really liked this class because it’s structured to include art (sensory and tactile art projects for the babies to experience different textures), outdoor play (in a baby sized playground), story time (complete with sound effects) and drama time (where teachers and assistants act out simple skits). As a first time mom, I was very impressed with Play Nest! At twice a week, it wasn’t too heavy a time commitment and I loved bringing Fighter to school and letting him socialize with other babies. 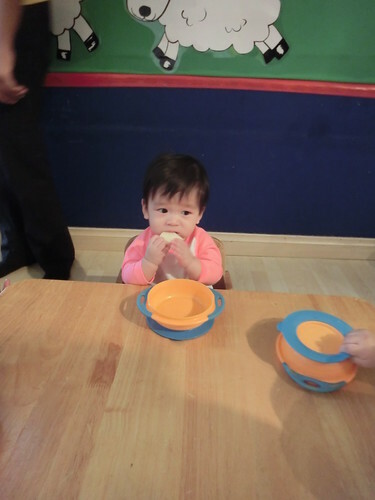 Babies get to practice their motor skills and eating too during snack time hehehe. And snack time comes with baby sized chairs and tables!! Play Club is what comes after Play Nest and it’s Julia Gabriel’s most popular class, looking at the amount of kids trying to get in lol. It’s also twice a week, for two hours each time. In Play Club, the activities are expanded from Play Nest, They explore different themes each term (animals, transportation, etc) and different letters and numbers weekly. Then they do arts and crafts, story telling, explore an object based on the theme of the day, snack time, outdoor play, and music time. I’m not sure but I think very few programs in Klang Valley besides Play Club are adult accompanied which could be why it’s so popular. It’s a great way for parents of babies who are too young to to go school yet to bring them into a structured environment filled with stimuli and socialization, AND I think most parents love the fact that there’s this time slot to just hang out and bond with their babies without interruption, and while the program is taken care of. Lolol. Fighter attended Play Club for a year or so before preschool I think. When he first started he couldn’t even walk wtf (ya he was that slow :X) but when he saw his peers walking around him, he actually tried to stand up and walk as well. He never had that inclination before! I think the best part of PC for me was that he got to really play and socialize with other babies, especially valuable cos he was an only child at this point). Like its name implies, IPC is like Play Club except its three times a week, 2.5 hours each time and is unaccompanied. It’s meant to be a transition between baby classes and proper preschool. Penny attended Play Club for a while but I didn’t feel it was as beneficial for her as it was for Fighter. For one, she has her Koko and we hang out with their BFFs Chase and Mia a lot so she didn’t really need the socialization. And another thing is while adults in class has its benefits, in Penny’s case I felt she didn’t really need it. On days when I couldn’t go and her nanny took her, she was completely independent and engaged. But if I was there, she’d be all teh and stick to me like a barnacle wtf. I switched her over to Independent Play Club 1-2 months ago (which caters to max 10 kids, 3 teachers) and after a few weeks of crying when I left, she settled down on her birthday itself. Now I take her in to class, tell her I’m going, and receive a wave and a kiss from her. By the time I step out the door, she’s gone back to playing hahahaha. Another version of Play Club except at least one of the teachers speaks only in Mandarin. It’s meant to increase exposure of the kids to Mandarin but I didn’t opt for this cos it’s only once a week. Pre-N is a very similar option to Independent Play Club. It’s a program under Chiltern House (which offers the Nursery & Kindergarten programs) and is meant for kids turning two, although they also have to be at least 18 months when they enroll. It runs Mon-Fri from 8.30-11.30 am. I struggled for a while trying to decide whether to send Penny for this or for IPC. In the end I chose IPC cos she just turned two! I very tak sampai hati send her to school every day hahaha I guess on some days I still want my baby at home with me? It’s just different options though – while I have no experience with Pre-N, I hear it’s more structured and a more “school-like” environment. It’s a max of 10 kids with 2 teachers (1 English and 1 Mandarin). Fighter attended N1 last year and is in N2 now. Like I’ve mentioned, we don’t have experience with other schools but I had good reason to stay at Chiltern House. For N1 onwards, there are options for half or full day classes but Fighter has always attended only half day because clingy mom wtf. All Chiltern programs are bilingual so it’s great exposure to Mandarin for the kids right away (especially if they’re like ours wtf). And what I really appreciated is that unlike most schools that require kids to be potty trained, CH teachers help or even lead the potty training. This was so useful to me as a first time mom. Fighter’s N1 teacher, with her experience, knew exactly when Fighter was mentally and physically ready and she initiated his potty training. I just followed her example and in a week he was perfectly potty trained. I find the teachers extraordinarily caring and loving too! Fighter had terrible separation anxiety in N1 and his N1 teacher did so much to make me feel better – from sending me photos of him in school to updating me daily through whatsapp or after school. She was also so loving and motherly Fighter would only go to school if she was there wtf. Report card day where teachers give a progress report on the child (you can see Penny crawling around on the floor hahaha). She wasn’t the only one either! The teachers in N2 are equally caring, and I’ve heard from parents who moved their kids to other schools that they had a bit of a culture shock cos teachers at other schools seem more standoffish than the ones at Chiltern. Fighter really blossomed at Chiltern la. From a snivelling toddler who cried half the year, and whined the other half FML, he now goes to the toilet by himself and eats independently with all his friends every day. From crying every day when I take him to class, I now drop him off at the school gate and he walks in by himself with his teachers. From not understanding a word of Mandarin, he now randomly tells me how to say phrases and words in Mandarin now (but accent very ang moh wtf). To me academics during early childhood isn’t as important as setting the foundation for life and social skills which is what Chiltern really achieved for Fighter. I totally plan to continue Penny at Chiltern too after she completes her Julia Gabriel IPC. Need more info on the schools? Here – Julia Gabriel and Chiltern House. No doubt its a good pre-school, but it’s abit on the pricey side. Also, it requires adult supervision, so it’s more difficult for both working parents who doesn’t have help/nanny. Of course. I’m not saying this is the only option for preschools. You have to choose a school based on your lifestyle and preference. My blog post is an overview of the programs offered by JG and CH for parents who may be interested. There are a lot of families who want adult accompanied programs, you’ll be surprised. I am from Singapore and being a working parent, it is impossible for me to send my child to an adult-accompanied school on weekdays 🙁 But thankfully JG has playclub on Sundays so I intend to put my boy there when he turns 18 months. I also enquired about the price for full day cc at Chiltern House but is way out of my budget so no choice, he will go to a full day cc near my house. I just hope he gets a chance to attend JG as I heard such good reviews about it, a term or two is sufficient for me!